The Army has admitted feeding the public with bareface lies over the abduction of NNPC staff by a faction of Boko Haram in the Lake Chad Basin on Tuesday, 25 July. The Army had claimed in a statement on Wednesday through its spokesman, Brigadier-General Sani Usman that all the abducted staff of NNPC had been rescued by soldiers during a search and rescue operation in the area. He added that only nine soldiers died during the ambush. 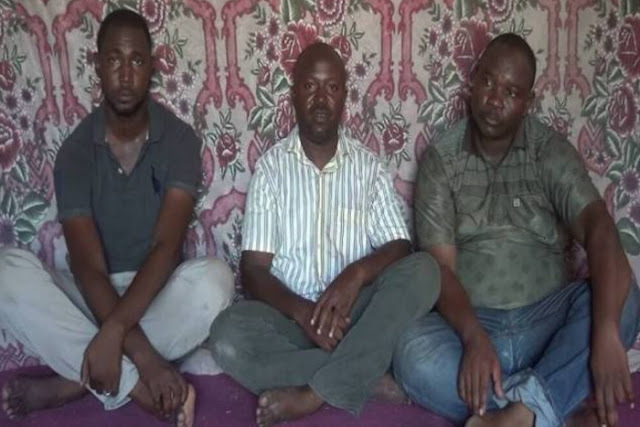 To counter the lies, the Abu Musab al-Barnawi led faction of Boko Haram released a video on Saturday showing some of the abducted NNPC staff begging the Federal Government to negotiate with the sect for their freedom. Also, forty-eight corpses of persons killed by the terrorists during the ambush on Tuesday were brought to the Maiduguri Teaching Hospital in the Borno State capital on Thursday. But in a rare show of remorse after the Boko Haram video hit the air waves, Brigadier-General Usman in another statement on Saturday said his initial statement that all the Nigerian National Petroleum Corporation (NNPC) workers abducted in the ambush had been rescued was wrong. He added that six members of the NNPC exploration team out of 12 that went out are still missing, while one of the NNPC staff returned to base alive. Usman revealed further that the death toll from the July 25 ambush of oil workers and staff members of the University of Maiduguri in Borno by Boko Haram has risen with the recovery of more bodies. According to him, 21 more bodies of those on the team that was ambushed by the terrorists had been recovered with some persons still missing. “So far the search and rescue team has recovered additional bodies of 5 soldiers, 11 Civilian JTF and 5 members of the exploration team,” Usman stated. Describing the ambush as “as unfortunate and highly regrettable”, Usman said his initial statement that all the NNPC workers abducted in the ambush had been rescued was wrong. According to him, the pursuit team also recovered two of army’s gun trucks and an additional Toyota Buffalo Gun truck from the insurgents. “In addition, the team also made the following recoveries; four rocket-propelled grenade bombs, four rocket propelled grenade chargers, six AK-47 rifles, one anti-aircraft gun, on general purpose machine gun, one anti-aircraft gun barrel, one rocket-propelled grenade tube, four Dane guns, eight tyres and two Tyre Rims,” it added. Other items recovered include one pumping machine, two tyre jacks, one super battery, five reflective jackets, three Toyota Hilux vans, four Jerry cans filled with PMS, one Motorola Radio, one Geographical Positioning System (GPS), 21 empty Jerry cans, two shovels and three food coolers. The troops also recovered 122 rounds of PKM ammunition, 213 rounds of 7.62mm NATO ammunition, 1255 Anti-Aircraft Guns ammunition, 4 boxes of API 12.7mm ammunition, 1 AK-47 Rifle Magazine, a Digger, two bows and 13 arrows, 2 LLG bombs, assorted drugs and assorted working tools. Boko Haram insurgents had on July 25 ambushed troops, including members of the Civilian Joint Task Force, escorting some staff members of the NNPC as well as that of the University of Maiduguri who were carrying out oil exploration activities in Borno Yesu District of Magumeri Local Government Area of Borno state.